There are hundreds of cryptocurrencies traded 24/7, multiple time frames that can be used to analyze them, and on top of that, there are endless technical analysis indicators and patterns that any trader can use to take his decisions. With so many variables involved, every single day there are endless opportunities that any trader can exploit. Coinrule helps you to manage all these variable, allowing you to define the conditions that you require to take a specific action for your trading activity. If you look at a chart, you will tend to anticipate “what’s next”, instead, a cryptocurrency trading bot can accurately examine the market, looking for a specific condition. No emotions involved means more efficiency for your trading. Here, for example, looking at the EOS chart and imagining to be at the moment prior the orange vertical line, you wouldn’t have enough information to say where the price is heading. The price can break below the support, sellers are “stronger” than buyers, and so, we are not interested in buying at this point, at the contrary, we should sell if we have some EOS in our wallet. 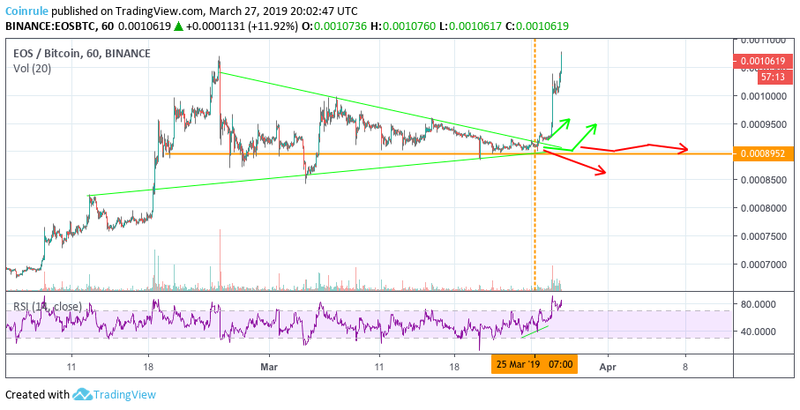 Given our assumption about how the market could evolve, we can say that if you want to buy EOS, the first two scenarios are ideal for initiating a new position (or for adding to one already in place) with an excellent risk-reward profile. With a clear trading plan in mind, you can use Coinrule to set up your automated trading strategy. This is a very common situation in which a trading bot will make your life much easier. In the Rule Page, you can create your strategy in minutes. 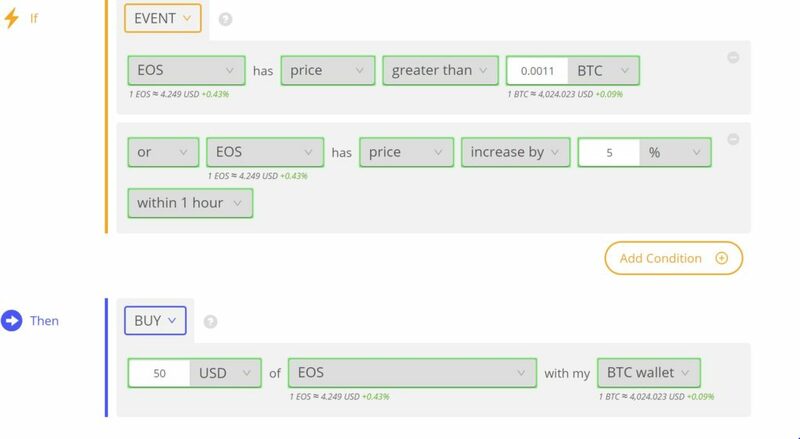 First, select the exchange you want to trade on, then fill in the fields according to your view. “if EOS has a price greater than 0.0011 BTC”. Finally, decide how many times you want this rule to be executed, name the rule created, revise it and you will be ready to launch your strategy live on the market. You can see now how easy it is to plan a trading strategy, design it and run it in minutes with Coinrule! Follow us on Twitter and Telegram for daily updates and new trading ideas!